Trump began his reelection campaign unusually early for an incumbent President. He began spending for his reelection effort within weeks of his election, and officially filed his campaign with the Federal Election Commission on the day of his inauguration. Since February 2017, Trump has held several rallies and a fundraiser for this campaign. He has visited key electoral states. The campaign has raised funds and run two nationwide advertising campaigns. The campaign has announced, and Trump has confirmed in several stump speeches, that the slogan for the 2020 race will eventually be changed from "Make America Great Again" to "Keep America Great". As of March 2019, Trump continues to use the old slogan. On November 7, 2018, Trump confirmed that Mike Pence would be his vice presidential running mate in 2020. Trump's predecessors merged their campaign committees into their party's committee following their election victories. Following his 2016 election victory, Trump eschewed this presidential tradition and retained a separate campaign committee which continued raising funds. In December 2016, the campaign raised $11 million. These moves indicated that Trump was already eyeing a 2020 run. Trump started spending money on the 2020 race on November 24, 2016 (sixteen days after the end of the 2016 election). The earliest campaign disbursement that his committees reported was spent towards the 2020 presidential primaries was for the purchase of a Delta Air Lines ticket on this date. Trump officially filed his reelection campaign with the FEC on January 20, 2017, the day of his inauguration. Trump launched his reelection campaign earlier in his presidency than his predecessors did. Barack Obama, George W. Bush, Bill Clinton, George H. W. Bush and Ronald Reagan all declared their candidacies for reelection in the third year of their presidencies. Trump filed the papers for his reelection campaign approximately 47 months prior to the date of the election. In contrast, both Reagan and George H. W. Bush filed approximately twelve months, George W. Bush filed approximately eighteen, and both Clinton and Obama filed approximately nineteen months prior to the date of the election. While previous presidents had held rallies in the early days of their presidency to garner support for legislation, such rallies differed from those held by Trump in that they were funded by the White House rather than by campaign committees. One of the advantages of having his campaign committee fund the events is that organizers can more discriminately screen attendees, refusing entry to non-supporters. Trump's February rally in Melbourne, Florida was the earliest campaign rally for an incumbent president. By filing for his campaign as early as he did, Trump gave also himself a head start on fundraising. This can theoretically help discourage primary challengers. Trump will be 74 years old by election day 2020. This would make Trump the oldest-ever presidential nominee on a major party ticket, surpassing Ronald Reagan and Bob Dole, both of whom were age 73 when they were the Republican Party nominees in 1984 and 1996, respectively. Although Trump's early campaign filing is extraordinarily unusual, aspects of a "permanent campaign" are not entirely unprecedented in American politics. Such a phenomenon had a presence in the White House at least as early as the presidency of Bill Clinton. Under the advice of Sidney Blumenthal, Clinton's staff continued to engage in campaign methodology once in office, using polling for assistance in making decisions. Political observers who bolster the opinion that a permanent campaign has had a significant impact on recent presidencies argue that decisions by presidents have increasingly been made with considerations to their impact on voter approval. The concept of a permanent campaign also describes the focus which recent presidents have given to electoral concerns during their tenures in office, with the distinction between the time they have spent governing and the time they have spent campaigning having become blurred. Political observers consider the rise in presidential fundraising as a symptom of the permanent campaign. The disproportionately large amounts of time that presidents have spent visiting key electoral states (and comparatively small amount of they have spent visiting states that pose little electoral importance to them) has been pointed to as evidence of ulterior electoral motives influencing presidential governance, emblematic of the blurred lines between campaigning and governance in the White House. For instance, George W. Bush embarked on 416 domestic trips during his first three years in office. This was 114 more than his predecessor Bill Clinton made in his first three years. In his first year, 36% of Bush's domestic trips were to the 16 states that were considered swing states after having been decided the closest margins during the 2000 election. In his second year, 45% of his domestic travel was to these states, and his third year 39% of his domestic travel was to these states. According to the Associated Press, a data analysis firm named Data Propria, launched in May 2018 to provide ad-targeting services and run by former officials of Cambridge Analytica, is working on public relations for the Trump 2020 re-election campaign. Presidential approval ratings have shown Trump to be one of the least popular presidents in the history of modern opinion polling as of his third year in office. Opinion polls have shown low support for Trump when compared to several hypothetical and declared Democratic candidates, including Joe Biden, Bernie Sanders, Cory Booker, Elizabeth Warren, and Kirsten Gillibrand when tested in hypothetical election matchups. Observers point out that presidential job approval is highly partisan: "During Trump's second year in office, which began Jan. 20, 2018, and ends Jan. 19, 2019, he averaged 87% job approval among Republicans and 8% among Democrats. Independents' views were closer to those of Democrats than to those of Republicans, with an average 36% of independents approving of Trump's performance in office." Gallup polling data shows that job approval for Donald Trump is approximately 87 percent among Republicans versus only 8 percent among Democrats. The reverse was the case for Barack Obama. For a more comprehensive list, see List of presidential trips made by Donald Trump. The following maps document the frequency with which President Trump has visited each state and territory during his presidency. On January 10, 2017, Politico reported that Trump would be keeping his campaign offices in Trump Tower open in order to lay the groundwork for a re-election campaign. By that time his campaign offices at Trump Tower already included a staff of about ten people led by Republican strategist Michael Glassner. Glassner's deputy is John Pence, nephew of Vice President Mike Pence. The campaign staff was focused on data-building and fundraising for a 2020 reelection campaign. On January 18, Trump revealed, in an interview with The Washington Post, that he had decided Keep America Great would be his 2020 reelection campaign slogan. Two days later, on the day of his inauguration, President Trump filed a form with the Federal Election Commission (FEC) declaring that he qualified as a candidate for the 2020 presidential election. The first rally organized by the campaign was held on February 18, 2017, in Melbourne, Florida, and was attended by an estimated 9,000 supporters. This was the earliest an incumbent president had ever held a campaign rally. During the rally, Trump defended his actions and criticized the media. He referred to a nonexistent incident that had supposedly happened in Sweden the previous night—"last night in Sweden...", while criticizing the asylum policies of several European countries. After backlash from the press and the Swedish government, Trump stated that he was referring to a Fox News program aired the previous day. By February 1, 2017, the campaign had already raised over $7 million. On February 24, Trump spoke at the Conservative Political Action Conference, an annual event which has often held a presidential straw poll. However the CPAC 2017 straw poll did not include a preference survey on presidential candidates. On March 4, there were a series of local rallies held by allies of the campaign in some 50 cities. Several of the rallies were met by counter-demonstrations where some protesters were arrested. Other events were held around the country throughout March, some of which resulted in violence. The campaign's second rally was held a month later in Nashville on March 15, and coincided with the 250th birthday of Andrew Jackson. Prior to the rally, Trump paid tribute to Jackson and laid a wreath at his tomb. 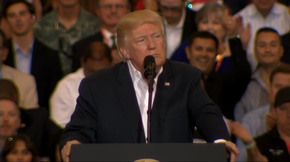 During the rally, Trump promised to repeal the Affordable Care Act and defended his revised travel ban, hours before it was put on hold by Derrick Watson, a federal judge in Hawaii. A third rally was held by the campaign in Louisville on March 20. At the rally, Trump promoted efforts to repeal the Patient Protection and Affordable Care Act (also known as "Obamacare"). On March 29 it was reported that Lara Trump, the daughter-in-law of the president, had been hired as a consultant by the campaign's digital vendor Giles-Parscale. By mid-April the Trump campaign had a staff of around twenty employees. Trump gave a speech on April 28 at an event for the National Rifle Association. 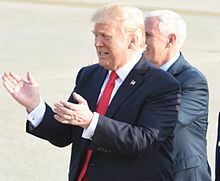 Trump and Pence arrive in Pennsylvania on April 29 for their rally in Harrisburg. Trump held his fourth campaign rally on April 29 in Harrisburg, Pennsylvania, which coincided with the hundredth day of Trump's presidency. It also took place the same night as the White House Correspondents' Dinner, which Trump did not attend. In addition to Trump, Vice President Pence also spoke at the April 29 rally. On May 1 the campaign announced that they were spending $1.5 million on national advertisements touting Trump's accomplishments in the first hundred days." The ad buy, which included advertisements targeted at voters who supported specific agenda items of Trump's presidency, came approximately 42 months before election day 2020, or any other major party's candidate declarations. FactCheck.org found several inaccuracies in the advertisement, and Eric Zorn of the Chicago Tribune described the 30-second advertisement as being, "stuffed with Trump's signature misleading puffery". Additionally, original versions of the ad showed Trump shaking hands with H. R. McMaster, an active-duty military member who was barred from participating in any political advocacy while in uniform. Subsequent airings of the advertisement substituted this clip. The ad claimed that the "fake news" media refused to report the successes of the administration, but Forbes pointed out that the ad itself cited mainstream media sources including CNBC, The Boston Globe and The New York Times. Because of this accusation against the news media, CNN decided to stop running the ad, a decision that campaign manager Michael Glasner criticized as an action to "censor our free speech". ABC, CBS and NBC later joined CNN in refusing to play the ad. Lara Trump, a consultant to the campaign and the daughter-in-law of the president, called the ad removals "an unprecedented act of censorship in America that should concern every freedom-loving citizen." On May 8, shortly after reporter Cecilia Vega asked White House Press Secretary Sean Spicer about statements that Trump's 2016 campaign had issued in regards to temporarily banning Muslims from entering the United States, Trump's campaign website purged itself of all campaign statements from the 2016 campaign. Campaign chairman Michael Glassner later announced that the website was being redesigned. The redesign of Trump's campaign website was seen by media sources as laying the groundwork for a full-bodied reelection campaign. The Washington Examiner's David Druckert pointed out on Twitter that the redesigned website featured an image of Trump with a uniformed military officer on its 'Donate' page, which violated the Department of Defense's regulation that prevented uniformed military officers from engaging in any political activity. On May 18, Trump hosted chairmen of the Colorado, Iowa, Michigan, New Hampshire, North Carolina, Ohio and Pennsylvania state parties at the White House. 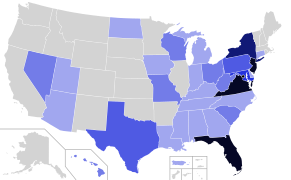 Each of their states are considered to be presidential swing states. On May 25, Trump's sons Donald Jr. and Eric along with Eric's wife Lara held a series of meetings at the Republican National Committee's (RNC) Washington, D.C. offices to outline campaign strategy. On June 1, President Trump announced his plans to withdraw from the Paris Agreement saying, "I was elected to represent the citizens of Pittsburgh, not Paris." Soon afterwards, the campaign announced it would hold a Pittsburgh Not Paris Rally across from the White House. The rally was held June 3 at Lafayette Square. The event was sponsored by the Fairfax County Republican Committee and the Republican Party of Virginia. Relatively few people attended the event, with estimates varying from 200 people (including counter-protesters) to "dozens" of supporters. By comparison, more people attended the anti-Trump March for Truth, which was held the same day. 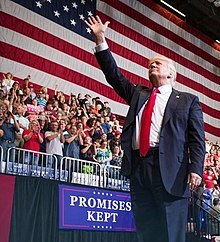 The president made June presidential visits to the swing-states of Florida, Ohio, and Wisconsin, where he held speeches that were arranged so that he would be surrounded by crowds of his own supporters. Despite these trips, by the end of June Trump still lagged severely behind the number of states that his immediate two predecessors had visited during the first six months of their presidencies. Both Obama and George W. Bush visited every time zone in the continental United States, but Trump had visited only the Eastern and Central time zones. Obama and Bush took both overnight and multiple-day trips throughout the country. In contrast, Trump's domestic travels had largely been limited to a two-hour flight radius of Washington, D.C., and his only overnight stays were at Camp David, Mar-a-Lago and Trump National Golf Club in Bedminster. One of the benefits that Trump is speculated to obtain from such trips is more favorable coverage from local news outlets in the areas visited. Most of Trump's trips to Wisconsin were focused on the Milwaukee area in the southeast part of the state, which Trump won in 2016 by a significantly smaller margin than Mitt Romney had in 2012. Trump also began campaigning in Iowa. 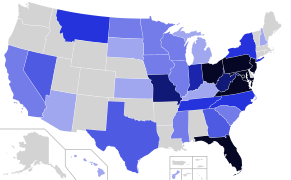 Iowa is considered to be a perennial swing state. The Iowa caucus is scheduled as the earliest presidential primary election. Iowa has also been home to nonbinding straw polls held ahead of the primaries (Trump won the 2015 straw poll among Republican candidates). 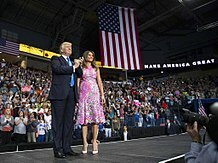 On June 7, President Trump delivered what the New York Daily News described as a “campaign-style speech” in Cincinnati, Ohio. Five days later, reports surfaced that Trump was making plans to embark on a more expansive tour that would visit several battleground states. Trump held his fifth official campaign rally in Cedar Rapids in eastern Iowa. The area, home to a large population of working class whites, was seen as a strong region for Trump to find a base of political support. The date for the rally, having been changed several times, was ultimately held on June 21, marking the first time in his presidency that Trump traveled west of the Mississippi River. At the rally, Iowa GOP state chairman Jeff Kaufmann verbally attacked Nebraskan Senator Ben Sasse, who has been speculated by some as a potential challenger to Trump in the 2020 Republican primaries. Vice President Mike Pence attended Joni Ernst's 3rd Annual Roast and Ride fundraiser, held on June 3 at the Central Iowa Expo near Boone, Iowa. The previous editions of this event have included presidential campaign appearances. Trump himself had previously attended Ernst's fundraiser in 2016 while campaigning in Iowa, and seven Republican presidential contenders attended the event in 2015. On June 28, the president hosted a fundraiser at his company's hotel in Washington, D.C. benefitting the Trump Victory Committee, a joint fundraising committee that raises funds for both his reelection campaign and the RNC. The fundraiser was the first event that Trump hosted for the Trump Victory Committee since becoming president, as well as the first presidential campaign fundraiser. The event was co-organized by RNC chairwoman Ronna Romney McDaniel and RNC National Finance Chairman Steve Wynn. The fundraiser was attended by about 300 guests and was reportedly expected to gross $10 million. Trump was joined at the event by First Lady Melania Trump and top White House advisors. Among those reported to have been in attendance at the fundraiser were Mica Mosbacher, Dean Heller and Katrina Pierson. Additionally, Harold Hamm and a number of high-profile figures were spotted in the hotel's lobby during the event. Press were barred from the event, a break of precedent since reporters were permitted to the first fundraisers held by both of Trump's two predecessors. Additionally Trump's decision to host the event at a venue from which he personally profits garnered criticism. Lara Trump also made appearances on behalf of the campaign at events in New York and Texas during the month of June. In New York, Lara spoke at the Sheraton New York Times Square Hotel on June 20 for the annual New York Republican State Committee gala. On July 1, Trump delivered a speech at the John F. Kennedy Center for the Performing Arts during an event honoring veterans. The event was sponsored by First Baptist Dallas and the Salem Media Group. The event was described as resembling one of Trump's campaign rallies. On July 6, The Hill and Newsweek reported that 2020 campaign merchandise bearing Trump's name (including merchandise supporting and opposing his candidacy) was selling more than those with the names of prospective opponents. First Daughter and Advisor to the President Ivanka Trump introduced Vice President Mike Pence at a GOP fundraiser. In its July 15 financial disbursement filing, the campaign reported that on June 27, nearly two-weeks before news of the Trump campaign–Russian meeting first surfaced, having made a payment Alan Futerfas, who is now defending the president's son Donald Trump Jr. for his involvement in that meeting. On July 24, Trump gave a highly political address at the National Scout Jamboree, an event that is traditionally supposed to be a non-political event. This was emblematic of Trump's repeated tendency to treat events that are supposed to be strictly nonpolitical as though they are campaign rallies. Trump held his sixth campaign rally on July 25 at the Covelli Centre in Youngstown, Ohio. During the speech, Trump reveled in addressing an audience outside of the national capital. He also condemned "predators and criminal aliens" and called them "animals". Chicago Tribune writer Rex W. Huppke criticized this comment, comparing it to the previous day's remarks at the National Scout Jamboree. Trump also made remarks on the homicide rate in Chicago, and called on the mayor, Rahm Emanuel, to "get tough"; Emanuel responded the following day, stating: "It is not about being tough, it's about being smart and strategic." Trump held his seventh campaign rally at the Big Sandy Superstore Arena in Huntington, West Virginia on August 3. During the rally, Trump attacked Democrats and criticized the ongoing investigations into Russian interference in the 2016 elections. At the rally, West Virginia's Governor Jim Justice made the surprise announcement that he was changing his party affiliation from Democrat to Republican. Vice President Mike Pence strongly denied charges lodged by an August 5 New York Times report, which speculated that the Vice President was orchestrating a "shadow campaign" for the presidency in the 2020 election. Pence called the accusations "disgraceful and offensive" and Counselor to the President Kellyanne Conway called the story a "complete fiction, complete fabrication". On August 13, Trump's campaign released an advertisement entitled, Let President Trump Do His Job. The ad attacks those that Trump alleges to be his "enemies", and was released one day prior to violent far-right protests in Charlottesville, Virginia. The advertisement portrays Trump's enemies as being Democrats, the media and career politicians. The ad includes clips of various journalists, including several that work at CNN. CNN refused to play the ad, and campaign chairman Michael Glassner derided CNN's decision as “censorship". In retaliation to CNN, the President retweeted a far-right activist's post featuring an image of a "Trump Train" running over CNN. The tweet, which was later deleted, received criticism after a vehicular attack in Charlottesville that injured and killed counter-protesters. Trump held his eighth campaign rally on August 22 at the Phoenix Convention Center in Phoenix, Arizona. The rally was the campaign's first event in the Western United States. Before attending the rally, Trump toured a U.S. Customs and Border Protection facility. In addition to the president, Vice President Mike Pence and Secretary of Housing and Urban Development Ben Carson also spoke at the rally, with Carson's appearance being criticized as possibly in violation of the Hatch Act of 1939 due to his status as current HUD secretary. Phoenix's Mayor Greg Stanton had repeatedly asked that Trump postpone the event after the protests in Charlottesville. During the rally, Trump spent approximately fifteen minutes commenting on the events in Charlottesville and criticizing the media for supposedly mischaracterizing his words, while omitting previous statements about the rally's "many sides" of culpability (a move that was later criticized as misleading). Trump also issued repeated attacks towards the media, accusing them of being "liars" and "sick people" responsible for creating "division" in the country. He accused activists seeking the removal of Confederate monuments of “trying to take away our history" and hinted at pardoning Joe Arpaio. Trump also made verbal attacks on both of Arizona's US Senators, Jeff Flake and John McCain. Additionally, Trump threatened to shut down the U.S. Federal Government if he was unable to secure funding to construct a border wall, mentioned tensions with North Korea, accused Democrats of being "obstructionists", described his own restraint as being "very presidential", and declared that "at some point” the United States would "end up probably terminating the North American Free Trade Agreement. After the rally, fact-checkers found numerous false statements in Trump's remarks. Trump's speech was described as “angry”, "incendiary", “downright scary and disturbing”, "continu[ing] to divide this country", and "a total eclipse of the facts" (a reference to the previous day's solar eclipse). A mostly well-behaved group of protesters gathered outside the rally, but after Trump's speech, the police unleashed CS gas on and fired pepper-spray projectiles and rubber bullets at the protesters, reportedly in response to a few protesters throwing rocks and bottles at police. Saturday Night Live Weekend Update Summer Edition parodied the rally, and the following week, Bloomberg News reported that Trump punished George Gigicos for the rally's small attendance. The day after his speech in Phoenix, Trump made his first presidential visit to Nevada (a swing state) for an American Legion event in Reno. Unlike during the previous night's rally, Trump did not attack Governor Brian Sandoval and Senator Dean Heller, two Republican politicians in attendance who have stood in opposition to some of the healthcare proposals championed by the president. An August 21 Politico report written by Alex Isenstadt entitled Trump ramping up for 2020 reelection offered new several revelations about the campaign effort. The report discussed plans for an autumn campaign fundraising tour anticipated to rake-in tens of millions of dollars. Pollster John McLaughlin, an advisor for Trump's 2016 campaign, was also appointed to advise Trump's 2020 efforts. The Trump campaign supposedly discussed monitoring individuals listed as being potential 2020 Democratic candidates and Republican challengers, and reportedly devised a plan to have White House Chief Strategist Steve Bannon propose the idea of regulating Facebook as a public utility, a move meant to intimidate Facebook CEO Mark Zuckerberg into dropping rumored plans to run. The report also said that the campaign and Trump's family members had been meeting monthly with the RNC to coordinate their election efforts, especially in North Carolina, which Trump won by less than 4 percentage points in the 2016 election. Finally, it was mentioned that a large part of the campaign's efforts thus far have involved an expansion of its data program being overseen by Brad Parscale. On his August 29 visit to Texas following Hurricane Harvey, the president made the unusual move of delivering an impromptu campaign-style speech. On September 16, groups supporting Trump organized a rally on the National Mall named the Mother of All Rallies. Organizers were originally hoping to draw one million attendees. However, in planning for security, the Metropolitan Police Department of the District of Columbia expected that only 1,800 people would attend and, ultimately, only about one thousand people attended. A nearby Juggalo rally drew greater crowds than the pro-Trump rally did. A national organization had originally been planning to hold "We Support Trump" rallies across the nation on September 9, however subsequently reneged on those plans. However, an independent rally in support of Trump was subsequently announced to be held on that date in Georgetown, Delaware, in a county where Trump got a majority of the vote in 2016. The Georgetown rally was sponsored by the Sussex County Republican Committee and attended by 100 people. On September 26, Trump also attended a campaign fundraising dinner hosted by the Republican National Committee (RNC) in New York City. The event was reported to have raised nearly $5 million, with major donors spending up to $250,000 to dine with President Trump. Since Trump scheduled for a quick meeting with Nikki Haley and other U.N. officials immediately prior the fundraiser, he was able to file the travel expenses related to that visit to New York as "government business", thus making them the expense of the American taxpayer, and not his campaign. Trump's pattern of mixing travel for fundraising activities with travel for government business has drawn criticism from government watchdog organizations. Trump had been scheduled to headline a fundraiser in Dallas on September 27, which was canceled by its organizers in the aftermath of Hurricane Harvey. On October 16, Trump indicated his desire to see his 2016 general election opponent, Democrat Hillary Clinton, run again in 2020. This declaration came in a tweet, and despite Clinton's repeated assertions that she has no desire to again run for public office. On October 25, the president traveled to Texas for a fundraiser hosted by the Dallas County Republican Party for both the RNC and his reelection campaign. The event was closed to the media. Mark Knoller noted, "By my count, this will be Pres Trump's 10th political fundraiser since taking office. 9 of 10 were closed to press coverage including today." In early November, ethics watchdogs and political analysts expressed concerns over Trump's daughter-in-law Lara Trump assuming a greater role in the White House, while also continuing to be an active member of Trump's reelection campaign. Lara Trump, while working for the reelection campaign, has quietly held political meetings with government officials such as Secretary of the Interior Ryan Zinke, Veteran Affairs Committee Chairman Phil Roe and Representative Ron DeSantis. David Gergen, who had served in the administrations of Richard Nixon, Gerald Ford, Ronald Reagan and Bill Clinton, commented "I cannot remember something like that ever happening in my time...This White House is being run like a family business, and campaigning is their bread and butter." In December 2017, polls showed that more than 40 percent of Americans wanted Trump impeached, a number higher than the percentage of Americans who said they planned to vote to reelect the president in the 2020 election. President Trump also held a rally in Pensacola, Florida, to campaign for Alabama U.S. Senate Candidate Roy Moore. In February 2018, the Trump campaign sent out an email with a photo of Trump paying a hospital visit to a student survivor of the Stoneman Douglas High School shooting. After stating that Trump prioritises the safety of American students and schools, the email linked to the campaign's donations page. Brad Parscale was chosen as Trump's 2020 campaign manager in February 2018. On February 25, the Drudge Report announced that the president had chosen Brad Parscale as the campaign manager for his re-election campaign. Parscale was the digital strategist for the previous campaign as the head of Giles-Parscale, which raised some concerns about how the campaign would conduct its advertising. On March 10, Trump held a rally in Moon Township, Pennsylvania. He campaigned for Rick Saccone for the local special election and also declared that his 2020 campaign slogan would be "Keep America Great!". On March 13, Trump made his first trip to the state of California as president to attend a campaign fundraiser at the Beverly Hills home of Tampa Bay Buccaneers owner Ed Glazer. The same day, it was announced that Katrina Pierson and John McEntee had been hired by the campaign as senior advisors. In 2018, Trump skipped the White House Correspondent's Dinner, holding a rally on the same night (as he had the previous year), this time in Washington, Michigan. 'Keep America Great!' Because we are doing so well that in another two years when we start the heavy campaign, 'Make America Great Again' wouldn't work out too well. It's going to be 'Keep America Great' because that's exactly where we are headed. But don't tell anybody. I don't want anybody to know. On June 20, President Trump held a rally in Duluth, Minnesota supporting Republican Congressional candidate Pete Stauber in the 2018 midterm elections and addressing his own 2020 prospects in the state among other subjects. The rally came on the day the president had signed an Executive Order on the treatment of immigrant families with children. At the rally he said enforcement at the border would be “just as tough" under the Executive Order. Trump traveled to the Nevada Republican Convention in Las Vegas on Saturday, June 23, and also appeared on the trip at a fundraiser for U.S. Senator Dean Heller. Along with policy issues Trump addressed Heller's challenger, U.S. Representative Jacky Rosen, as "Wacky Jacky". The president continued, asking of the simultaneous Nevada Democratic Party convention in Reno featuring Sen. Elizabeth Warren of Massachusetts, "Wacky Jacky is campaigning with Pocahontas, can you believe it?" On June 27, the president held a rally in Fargo, North Dakota, supporting Representative Kevin Cramer in his challenge to sitting Senator Heidi Heitkamp. President Trump also addressed, at the rally, the just-announced news of the retirement from the Supreme Court of Justice Anthony Kennedy. Cramer addressed the issue of abortion and Heitkamp's position on the Pain-Capable Unborn Child Protection Act as his reason for entering the race. "'On behalf of the most forgotten people,' Mr. Cramer said to the president as both men took the stage to deafening applause, 'the unborn babies, thank you for standing for life.'" During a campaign rally in Houston on October 22, Trump defined himself as a nationalist. He acknowledged the controversial use of this word, stating: "We’re not supposed to use that word, […] but I’m very proud. I think it should be brought back." The campaign finances a number of rallies, in support of Republican candidates in the Midterm election. These are somewhat successful, as the Senate's Republican majority is slightly increased. However, the Republicans lost their majority with 40 seats in the House of Representatives. The campaign makes the unprecedentedly early move to merge the campaign's field operations with that of the Republican National Committee. The campaign tapped White House political director Bill Stepien and Director of Public Liaison Justin Clark as Senior Political Advisors, who would focus on delegate organization and to ensure that the 2020 Republican National Convention runs smoothly. In a unanimous vote, the Republican National Committee informally endorsed the President's campaign, and coordination between the two entities formally began. The first rally of the year took place at the El Paso County Coliseum, in El Paso, Texas on February 12. It was highlighted by pro-wall talking points and a BBC cameraman filming the event, getting into a scuffle with a supporter that the President disavowed. From February 28 to March 3, the annual Conservative Political Action Conference, or CPAC took place in National Harbor, Maryland. This year, the usual straw poll was not held, and on the last day, Trump made a two-and-a-half hour long speech, which was covered live by C-span and Fox News, and was prominently featured in media throughout the world. On March 24, Attorney General William Barr sent a four-page long letter to Congress summarizing the findings of the Mueller Report on Russian interference in the 2016 presidential election. While Donald Trump donated and loaned funds to his previous campaign during the Republican primaries, thus-far he has not donated any of his own money to his reelection campaign. Instead, his reelection campaign has solely solicited donations. Trump began fundraising for his reelection campaign immediately upon being inaugurated, years earlier into his presidency than his predecessors had. At the end of the first quarter of 2017, the campaign's three committees ("Donald J. Trump for President", "Trump Victory", and "Trump Make America Great Again Committee") reported raising a combined $13.2 million, the majority of which had come from small donors. Trump's campaign and the Republican National Committee (RNC) ultimately raised a combined $55 million in the first quarter. According to the National Review's Kelly Jane Torrance, Barack Obama and the Democratic National Committee had raised roughly $16 million in the same period of Obama's first term. On March 17, 2017 the campaign saw what was its highest single-day contribution total, with the campaign and its joint-fundraising-committee raising a combined total of $314,000. By the end of May the RNC had raised more than $62 million in 2017. The RNC had already received more online donations than they had in the entire year of 2016. On April 14, 2019 the campaign announced that it had raised $30 million in the first quarter of 2019, far outpacing the campaigns of his individual Democratic opponents in the same period. Average donations were $34.26, and nearly 99 percent of donations to the campaign were $200 or less. In addition, the Republican National Committee brought in $45.8 million in first quarter 2019. In April 2017, The Wall Street Journal determined that the Trump campaign had reported spending nearly $500,000 in payments to companies owned by Trump, amounting to more than 6% of the $6.3 million that the campaign reported spending. Additionally, the campaign spent more than $4 million on memorabilia (such as hats). In the third quarter of 2017, the Trump campaign spent $4.1 million (27% of its expenditures) on legal fees, including the personal legal expenses of Trump and his family. By this point, 10% of the campaign's overall spending since the beginning of the year had been on legal fees. As of March 2019[update], Trump's campaign had spent almost twice as much on Facebook and Google ads as the entire Democratic field combined. On January 23, 2019, The Republican National Committee, in a unanimous vote, informally endorsed the president, and began an effort to prevent a challenge to him by changing the "rules of the game." Super PACS supporting Trump's reelection campaign include Committee to Defend the President, Great America PAC, and Great America Committee. The Great America PAC received donations from, among others, former racer Walker Evans and Insperity executive Jay Mincks. The Committee to Defend the President super PAC received contributions from, among others, Enterprise Products executive Ralph S. Cunningham. The Center for Public Integrity published an analysis of 2017 first-quarter federal campaign spending records which revealed that two Super PACs supporting Trump, Great America PAC and Committee to Defend the President, had spent a combined $1.32 million on the 2020 election campaign. Ted Harvey serves as the chairman of the Committee to Defend the President. Eric Beach and Ed Rollins serve as co-chairmen of Great America PAC. Both PACs have previously been accused by the FEC of poorly maintaining financial records, and had been threatened with penalties. The Center for Public Integrity also found that several other pro-Trump PACs had already been founded in 2017, but most of them had yet to be very active. One such PAC was America First Action, which was founded by the CEO of a political consulting firm for which Trump's 2020 campaign treasurer is the senior vice president. On May 17, 2017, Mike Pence filed FEC paperwork to form Great America Committee, a PAC that would be headed by his former campaign staffers Nick Ayers and Marty Obst. This is the first time in US history that a sitting vice president has founded such a political organization. On August 7, Marc Lotter, a spokesperson for Mike Pence, confirmed to MSNBC's Hallie Jackson that the Vice President had hosted Republican donors, including mega-donors Charles and David Koch, at Number One Observatory Circle. At the end of the third quarter, the FEC calculated that in 2017 super PACS and other outside groups supporting Trump had spent more than $2 million. In late January 2017 several members of Trump's 2016 campaign staff formed America First Policies, a pro-Trump political nonprofit. Those involved included former deputy campaign chairs Rick Gates and David Bossie. Brad Parscale and Katrina Pierson were also involved. Additionally involved were Nick Ayers and Marty Obst, both of whom served as advisors to Mike Pence during the 2016 campaign. Trump's former White House Deputy Chief of Staff Katie Walsh has also joined the organization. Near the end of May, members of the organization (including Walsh) participated in meetings at the RNC's D.C. offices with members Trump's family to discuss campaign strategy. In 2017, Matt Braynard, a key member of Trump's 2016 campaign staff, established the organization Look Ahead America. The organization has taken steps to target inactive voters in places such as New Hampshire. Trump came close to winning New Hampshire in the 2016 election. Look Ahead America has claimed that it will not be coordinating their efforts with the president. ^ See List of Presidents of the United States by age. ^ a b c d Scott, Eugene (April 17, 2017). "Trump campaign raking in money for 2020, disclosures show". Cnn.com. CNN. Retrieved April 27, 2017. Trump's campaign committee has spent about $6.3 million during the first quarter of 2017. That includes giving more than $70,000 to the campaign committee's manager, Michael Glassner, who was Trump's deputy campaign manager, and more than $40,000 to John Pence, Vince [sic] President Mike Pence's nephew, who serves as the committee's deputy director. ^ a b c d e f g h Bender, Michael C. (February 19, 2019). "Trump adds senior campaign staff for 2020 race as risk of a GOP primary challenger rises". MarketWatch. Retrieved March 6, 2019. ^ a b c d e f g Levinthal, Dave (May 5, 2017). "Pro-Trump super PACs have already spent $1 million on Election 2020". Publicintegrity.org. The Center for Public Integrity. Retrieved May 6, 2017. ^ "Lara Trump becomes face of Donald Trump's 2020 re-election campaign". The Daily Telegraph. London. October 19, 2017. Retrieved April 23, 2018. ^ "TRUMP, DONALD J - Candidate overview - FEC.gov". FEC.gov. ^ a b Tumulty, Karen (January 18, 2017). "How Donald Trump came up with 'Make America Great Again'". The Washington Post. Retrieved March 5, 2017. ^ a b c "'Keep America Great': Trump Reelection Effort Raised $13M So Far, Report Says". insider.foxnews.com. Fox News. April 15, 2017. Retrieved April 28, 2017. ^ Benen, Steve (March 21, 2017). "Trump picks the wrong slogan: 'Promises made, promises kept'". Msnbc.com. MSNBC. Retrieved June 28, 2017. ^ Groppe, Maureen (November 7, 2018). "President Donald Trump and Vice President Mike Pence renew their political vows in advance of 2020". USAToday. Retrieved November 7, 2018. ^ Vogel, Kenneth P. (January 31, 2017). "Trump raised $11 million in December". Politico.com. Politico. Retrieved August 15, 2017. ^ a b c d Isenstadt, Alex (January 10, 2017). "Trump laying the groundwork for 2020 reelection bid". Politico.com. Politico. Retrieved February 26, 2017. ^ Bump, Philip (May 1, 2017). "Donald Trump started spending money on the 2020 race on Nov. 24". Washingtonpost.com. The Washington Post. Retrieved May 4, 2017. ^ a b "Details for Candidate ID : P80001571". fec.gov/. Federal Election Commission. ^ "FEC Form 99/Form 2" (PDF). Federal Election Commission. January 20, 2017. Retrieved February 26, 2017. ^ a b Gold, Matea. "President Trump tells the FEC he qualifies as a candidate for 2020". Washington Post. pp. January 20, 2017. Retrieved February 26, 2017. ^ a b c Herbert, Geoff (May 1, 2017). "President Trump launches first campaign ad for 2020 election – 1282 days away". Syracuse.com. Advance Digital. Retrieved May 4, 2017. ^ a b Diamond, Jeremy; Zeleny, Jeff (April 28, 2017). "Trump rallies: Campaign-funded, for a reason". Cnn.com. CNN. Retrieved March 26, 2017. ^ "Trump Returns to Campaign-Style Events to Shore Up Support After Setbacks". Newsweek.com. Newsweek. Reuters. February 17, 2017. Retrieved May 8, 2017. ^ a b c d Santhanam, Laura (August 3, 2017). "Watch: Trump blasts Democrats, Russia investigations at campaign rally in Huntington, West Virginia". Pbs.org. PBS NewsHour. Retrieved August 23, 2017. ^ a b c d Graham, David A. "Trump Kicks Off His 2020 Reelection Campaign on Saturday". The Atlantic. Retrieved February 17, 2017. ^ a b c "A Look At How Trump Is Already Campaigning For 2020". Npr.com. All Things Considered. August 23, 2017. Retrieved September 4, 2017. ^ New York City Department of Health (June 14, 1946). "Donald Trump Birth Certificate" (PDF). ABC News. Archived from the original on May 12, 2016. Retrieved April 18, 2017. ^ "When is Election Day in 2020?". When-is.com. n.d. Retrieved April 18, 2017. Election Day in 2020 is on Tuesday, the 3rd of November. ^ Malone, Clare; Aschwanden, Christie (September 13, 2016). "Can A Candidate Be Too Old To Run For President?". Fivethirtyeight.com. FiveThirtyEight. Retrieved March 18, 2017. ^ Kaufman, Sarah; Evers, Jishai (February 8, 2016). "Bernie Sanders Could Become The Oldest-Ever Presidential Nominee". Vocativ.com. Vocativ. Retrieved April 19, 2017. The oldest-ever presidential nominee for either party was Ronald Reagan, according to The American Presidency Project. In 1984 at the age of 73, he ran for re-election. ^ Schmuhl, Robert (September 24, 2012). "The Last Time America Had So Many Two-Term Presidents was the 1820s". historynewsnetwork.org. Columbian College of Arts and Sciences (George Washington University). Retrieved April 18, 2017. ^ Sharockman, Aaron (April 10, 2014). "How rare is it that we had three presidents re-elected consecutively? Very rare". Politifact.com. PolitiFact.com. Retrieved April 18, 2017. ^ a b c d e Corrado, Anthony; Tenpas, Kathryn Dunn (March 30, 2004). "Permanent Campaign Brushes Aside Tradition". Brookings.edu. Brookings Institution. Retrieved July 11, 2017. ^ a b c d "The Rise of the President's Permanent Campaign". Kansaspress.ku.edu. University of Kansas. n.d. Retrieved July 11, 2017. Brendan Doherty provides empirical evidence of the growing focus by American presidents on electoral concerns throughout their terms in office, clearly demonstrating that we can no longer assume that the time a president spends campaigning for reelection can be separated from the time he spends governing. To track the evolving relationship between campaigning and governing, Doherty examines the strategic choices that presidents make and what those choices reveal about presidential priorities. He focuses on the rise in presidential fundraising and the targeting of key electoral states throughout a president's term in office – illustrating that recent presidents have disproportionately visited those states that are important to their political prospects while largely neglecting those without electoral payoff. He also shows how decisions about electoral matters previously made by party officials are now made by voter-conscious operatives within the White House. ^ Jeff Horwitz (June 15, 2018). "AP: Trump 2020 working with ex-Cambridge Analytica staffers". Associated Press. Retrieved June 18, 2018 – via WashingtonPost.com. ^ Teri Robinson (June 18, 2018). "Data Propria, heir to Cambridge Analytica, working for RNC, possibly Trump campaign". scmagazine.com. Retrieved June 18, 2018. ^ Adi Robertson (June 15, 2018). "Trump's 2020 campaign is reportedly using former Cambridge Analytica employees to target voters". Theverge.com. Retrieved June 18, 2018. ^ Jeffrey M. Jones (April 23, 2019). "Trump Job Approval Slightly Improved in Ninth Quarter". Gallup. Retrieved April 23, 2019. ^ a b Reid J. Epstein (March 3, 2019). "Trump's Job-Approval Rating Ticks Up, Along With Warning Signs". Wall Street Journal. Retrieved March 3, 2019. ^ "Trump Begins Third Year With Low Job Approval and Doubts About His Honesty". Pew Research Center. January 18, 2019. Retrieved January 18, 2019. ^ Gary Langer (January 25, 2019). "Shutdown Blame Stays on Trump, With His Approval at a Historic Low" (PDF). Langer Research Associates. Retrieved January 25, 2019. ^ "Support For Impeachment At Record High". Public Policy Polling. Retrieved February 28, 2018. ^ Blanton, Dana (March 24, 2019). "Fox News Poll: Biden, Sanders top Democratic preference". Fox News. Retrieved March 24, 2019. ^ Jeffrey M. Jones. "Trump Job Approval Sets New Record for Polarization". Gallup. Retrieved January 16, 2019. ^ "Presidential Approval Ratings – Donald Trump". Gallup. Retrieved February 13, 2017. ^ "Presidential Approval Ratings -- Barack Obama". Gallup. Retrieved October 14, 2018. ^ "Donald Trump is already looking to 2020". Boston Globe. Associated Press. January 13, 2017. Retrieved March 5, 2017. ^ "Trump Reveals 2020 Re-Election Slogan: 'Keep America Great!'". FOX News Insider. Fox News. January 18, 2017. Retrieved March 5, 2017. ^ Superville, Darlene; Riechmann, Deb (February 18, 2017). "Outside of Washington, Trump slips back into campaign mode". Fox News. West Palm Beach, Florida. Associated Press. Retrieved March 5, 2017. ^ Miller, Zeke J. (February 19, 2017). "Trump Is Already Campaigning For Reelection in 2020". 'Fortune. Time Inc. Retrieved February 26, 2017. ^ "A newspaper has documented 'everything that happened in Sweden last night'". The Independent. February 20, 2017. Retrieved February 21, 2017. ^ Topping, Alexandra. "'Sweden, who would believe this? ': Trump cites non-existent terror attack". The Guardian. Retrieved February 19, 2017. ^ "Facts about migration and crime in Sweden". Swedish Ministry for Foreign Affairs. February 23, 2017. Retrieved February 24, 2017. ^ Donald Trump [@realDonaldTrump] (February 19, 2017). "My statement as to what's happening in Sweden was in reference to a story that was broadcast on @FoxNews concerning immigrants & Sweden" (Tweet) – via Twitter. ^ Chan, Sewell (February 19, 2017). "'Last Night in Sweden'? Trump's Remark Baffles a Nation". The New York Times. Retrieved February 22, 2017. ^ "Trump already has socked away more than $7 million for his 2020 reelection". Washington Post. Retrieved February 17, 2017. ^ Guardian Wires (February 24, 2017). "Donald Trump addresses CPAC 2017". Retrieved August 23, 2017 – via YouTube. ^ "CPAC 2015 Straw Poll: Rand Paul wins again – but Scott Walker is surging". The Washington Times. February 28, 2015. Retrieved August 23, 2017. ^ "CPAC 2017 Straw Poll Results". Conservative.org. American Conservative Union and The Washington Times. February 25, 2017. Retrieved August 23, 2017. ^ Stanglin, Doug; Alexander, Bryan (March 4, 2017). "Thousands of supporters 'March 4 Trump' at rallies across USA". Usatoday.com. USA Today. Retrieved May 2, 2017. ^ Bailey, Chelsea; McCausland, Phil (March 4, 2016). "Trump supporters across the nation gather for 'March 4 Trump'". Nbcnews.com. NBC News. Retrieved May 2, 2017. ^ Wang, Amy B (March 5, 2017). "Pro-Trump rally in Berkeley turns violent as protesters clash with the president's supporters". Washingtonpost.com. Washington Post. Retrieved May 2, 2017. ^ Campuzano, Eder (March 4, 2017). "March 4 Trump meets resistance during Lake Oswego rally". Oregonlive.com. The Oregonian. Retrieved May 2, 2017. ^ Carcamo, Cindy; Elmahre, Adam; Brazil, Ben (March 26, 2017). "Violence erupts at pro-Trump rally in Huntington Beach". Latimes.com. The Los Angeles Times. Retrieved May 2, 2017. ^ Beckwith, Ryan Teague (March 13, 2017). "President Trump Will Lay a Wreath at Andrew Jackson's Grave". Time Magazine. Retrieved May 3, 2017. ^ Meyer, Myer; Ebert, Joel (March 15, 2017). "Trump tours The Hermitage, lays wreath on Andrew Jackson's tomb". The Tennesseean. Retrieved May 3, 2017. ^ Schuessler, Jennifer (March 15, 2017). "A History of Presidents, Mostly Democrats, Paying Homage to Jackson". The New York Times. Retrieved March 3, 2017. ^ Graham, Chris (March 16, 2017). "Why is Donald Trump paying homage to Andrew Jackson and what are the comparisons?". Telegraph.co.uk. The Daily Telegraph. Retrieved May 3, 2017. ^ "Replay: President Trump speaks at rally in Nashville". www.tennesean.com. The Tennesseean. March 15, 2017. Retrieved May 2, 2017. ^ Thomas, Ken; Bykowicz, Julie (March 20, 2017). "Trump takes push for Obamacare repeal to Louisville rally". www.chicagotribune.com. Chicago Tribune. Associated Press. Retrieved August 25, 2017. ^ Bykowicz, Julie (March 29, 2017). "Lara Trump Hired by Trump Campaign's Digital Vendor". www.usnews.com. U.S. News & World Report. Associated Press. Retrieved June 11, 2017. ^ a b Vogel, Kenneth P. (April 15, 2017). "Trump's reelection campaign raised $13.2 million in first quarter". www.politico.com. Politico. Retrieved April 18, 2017. ^ Terkel, Amanda (April 28, 2017). "Trump Warns 'Pocahontas' May Run For President In 2020". www.huffingtonpost.com. HuffPost. Retrieved April 29, 2017. ^ Gregg, Christina (April 28, 2017). "Trump suggests potential 2020 election battle against 'Pocahontas' Elizabeth Warren". www.aol.com. AOL. Retrieved April 29, 2017. ^ Malawskey, Nick (April 26, 2017). "As President Trump heads to Harrisburg, anti-Trump rally planned". www.pennlive.com. Advance Digital. Retrieved April 27, 2017. ^ a b Jagannathan, Meera (April 23, 2017). "President Trump to hold rally same night as White House Correspondents' Dinner in Harrisburg, which he once called a 'war zone'". www.nydailynews.com. New York Daily News. Retrieved April 24, 2017. ^ "Trump avoiding White House Correspondents' Dinner". www.timesrecordnews.com. Tribune Content Agency, LLC. April 27, 2017. Retrieved April 27, 2017. ^ "Trump's campaign up with $1.5 million ad buy to tout early presidency". www.politico.com. Politico. May 1, 2017. Retrieved May 1, 2017. ^ a b c d Tilett, Emily (March 1, 2017). "Trump Campaign launches latest attack on media in $1.5 billion ad buy". www.cbsnews.com. CBS News. Retrieved May 1, 2017. ^ a b Benen, Steve (May 2, 2017). "Team Trump flubs the first ad of the 2020 election cycle". www.msnbc.com. MSNBC. Retrieved May 4, 2017. ^ a b c DePaolo, Joe (May 1, 2017). "'America is Winning': Donald Trump Launches 2020 Campaign Ad on His 102nd Day in Office". www.mediaite.com. Mediaite. Retrieved May 4, 2017. ^ a b Zorn, Eric (May 5, 2017). "No rest for the campaign weary: Trump 2020 ads begin". www.chicagotribune.com. Chicago Tribune. Retrieved May 10, 2017. ^ Robertson, Lori (May 2, 2017). "Trump's TV Campaign Ad". www.factcheck.org. FactCheck.org. Retrieved May 10, 2017. ^ a b Sheth, Sonam (May 1, 2017). "Trump reelection campaign pulls first 100 days ad amid concerns it may have violated federal law". Business Insider. Retrieved May 9, 2017. ^ a b Joyella, Mark (May 1, 2017). "Trump Releases Campaign Ad, And Yes, He's Running Against The News Media". www.forbes.com. Forbes. Retrieved May 4, 2017. ^ a b Martosko, David; Earle, Geoff (May 5, 2017). "It's not just CNN: Now ABC, CBS and NBC all refuse to run Trump re-election campaign ad that blasts them as 'FAKE NEWS'". www.dailymail.com. Daily Mail. Retrieved May 6, 2017. ^ Agard, Chancellor (May 2, 2017). "CNN refuses to air 'false' Trump campaign ad". www.ew.com. Entertainment Weekly. Retrieved May 2, 2017. ^ "Trump campaign says CNN refuses to run ad touting success". www.staradvertiser.com. Honolulu Star-Advertiser. Associated Press. May 2, 2017. Retrieved May 2, 2017. ^ Gold, Hadas (May 2, 2017). "CNN: We didn't run Trump ad because of 'fake news' graphic". www.politico.com. Politico. Retrieved May 2, 2016. ^ a b Romano, Nick (May 6, 2017). "Trump's reelection team says ABC, NBC, CBS blocked 'Fake News' ad". www.ew.com. Entertainment Weekly. Retrieved May 8, 2017. ^ Trump, Lara (May 5, 2017). "All Mainstream TV Networks Block Paid Campaign Ad Setting a Chilling Precedent Against Free Speech". Donaldjtrump.com. Donald Trump presidential campaign, 2020. Retrieved May 8, 2017. ^ Salaky, Kristin (May 8, 2017). "All Statements Scrubbed From Trump Campaign Site – Including Travel Ban". www.talkingpointsmemo.com. Talking Points Memo. Retrieved May 8, 2017. ^ Shelbourne, Mallory (May 8, 2017). "Trump call for Muslim ban deleted from site after reporter's question". www.thehill.com. The Hill. Retrieved May 8, 2017. ^ Marcin, Tim (May 9, 2017). "The White House is Trying to Make Trump's Muslim Ban Disappear". www.vanityfair.com. Vanity Fair. Retrieved May 10, 2017. ^ Miller, S.A. (May 9, 2017). "Trump campaign launches new website in re-election bid". www.washingtontimes.com. The Washington Times. Retrieved July 5, 2017. ^ May, Charlie (May 10, 2017). "Donald Trump launches a new website to gear up for 2020 re-election campaign". www.salon.com. Salon. Retrieved July 5, 2017. ^ Fredericks, Bob (May 9, 2017). "Trump launches new site for re-election campaign". www.nypost.com. New York Post. Retrieved July 5, 2017. ^ Marcin, Tim (May 9, 2017). "Donald Trump's New Website Features Military Personnel, Tweets, Merchandise". www.newsweek.com. Newsweek. Retrieved May 10, 2017. ^ Goodin, Emily (June 30, 2017). "White House Courting Key States Ahead of Election Season". www.realclearpolitics.com. RealClearPolitics. Retrieved July 1, 2017. ^ a b c Costa, Robert (May 27, 2017). "Trump family members met with GOP leaders to discuss strategy". www.washingtonpost.com. Washington Post. Retrieved June 19, 2017. ^ a b Benen, Steve (May 30, 2017). "Trump's family takes new steps to blur ethical boundaries". www.msnbc.com. MSNBC. Retrieved June 19, 2017. ^ a b Reyner, Solange (May 27, 2017). "Trump Family Members Meet With RNC Leaders to Discuss Strategy". www.newmax.com. Newsmax. Retrieved June 19, 2017. ^ a b c d Benen, Steve (June 5, 2017). "Trump campaign's 'Pittsburgh, not Paris' rally draws 'dozens'". www.msnbc.com. MSNBC. Retrieved June 5, 2017. ^ a b Juliano, Nick (June 2, 2017). "Trump campaign plans 'Pittsburgh, not Paris' rally to cheer climate deal exit". www.politico.com. Politico. Retrieved June 5, 2017. ^ Chait, Johnathan (June 3, 2017). "Trump Chooses Most Ironic Location in the Entire World for Anti-France Rally". www.nymag.com. New York. Retrieved June 6, 2017. ^ a b Vitali, Ali (June 2, 2017). "Trump Campaign Touts 'Pittsburgh Not Paris' Rally". www.nbcnews.com. NBC News. Retrieved June 5, 2017. ^ a b c d Subbaraman, Nidhi (June 3, 2017). "Trump Supporters And Some Climate Change Deniers Rallied To Thank Him For Leaving The Paris Agreement". www.buzzfeed.com. Buzzfeed News. Retrieved June 5, 2017. ^ a b Sheth, Sonam (June 3, 2017). "The White House hyped up a 'Pittsburgh, not Paris' rally – and Trump skipped it to go to his golf club". www.businessinsider.com. Business Insider. Retrieved June 5, 2017. ^ a b Connley, Courtney (June 3, 2017). "Trump supporters rally outside White House for 'Pittsburgh Not Paris' event". www.abcnews.go.com. ABC News. Retrieved June 5, 2017. ^ Colarossi, Sean (June 3, 2017). "Trump's 'Pittsburgh, Not Paris' Rally A Massive Flop Compared To Nationwide 'March For Truth'". Politicususa.com. Retrieved June 5, 2017. ^ a b c d Wagner, John; Parker, Ashley (June 20, 2017). "'He loves rallies': Trump Looks Beyond Washington for Support". www.washingtonpost.com. Washington Post. Retrieved June 28, 2017. ^ a b c d e f Liptak, Kevin (June 28, 2017). "President homebody: Trump stays close to the White House". www.cnn.com. CNN. Retrieved June 29, 2017. ^ "The Odds Of An Electoral College-Popular Vote Split Are Increasing". FiveT hirtyEight. November 1, 2016. Retrieved June 8, 2017. ^ McDermott, Monika (January 5, 2012). "Iowa's bad track record for picking GOP winners". www.cbsnews.com. CBS News. Retrieved June 9, 2017. For a few months every four years the state of Iowa becomes a focal point for the nation as it holds its first-in-the-nation presidential nominating contest - the Iowa caucuses. ^ Richardson, Bradford (August 17, 2015). "Iowa State Fair attendees pick Sanders over Clinton". www.thehill.com. The Hill. Retrieved June 9, 2017. ^ Bedard, Paul (June 12, 2017). "It's on: Trump to hit 2020 battleground states to pitch infrastructure, jobs". www.washingtonexaminer.com. Washington Examiner. Retrieved June 14, 2017. ^ a b "Cedar Rapids Trump rally postponed". www.thegazette.com. The Gazette (Cedar Rapids). May 27, 2017. Retrieved May 28, 2017. ^ a b Morin, Rebecca (May 15, 2017). "Trump cancels Iowa rally". www.politico.com. Politico. Retrieved May 15, 2017. ^ Diamond, Jeremy (June 21, 2017). "Trump set for victory lap at Iowa rally". www.cnn.com. CNN. Retrieved June 21, 2017. ^ Glueck, Katie (July 7, 2017). "How not to primary Donald Trump". www.mcclatchydc.com. McClatchy. Retrieved July 9, 2017. ^ Albert, Tim (June 22, 2017). "Iowa GOP Chairman Rips 'Arrogant Academic' Ben Sasse". www.politico.com. Politico. Retrieved July 9, 2017. ^ Petroski, William (July 8, 2017). "Reynolds: Yes, Senator Sasse, you're welcome in Iowa". www.desmoinesregister.com. Des Moines Register. Retrieved July 9, 2017. ^ a b Boshart, Rod (May 11, 2017). "Vice President Mike Pence coming to Iowa". www.thegazette.com. The Gazette. Retrieved May 28, 2017. ^ Chaitlen, Daniel (June 3, 2017). "Mike Pence and Sen. Joni Ernst arrive at Iowa event riding motorcycles". www.washingtonexaminer.com. The Washington Examiner. Retrieved June 5, 2017. ^ a b Isenstadt, Alex (May 31, 2017). "Trump to hold reelection fundraiser in June". www.politico.com. Politico. Retrieved May 31, 2017. ^ a b "Invitation". www.politico.com. Politico. n.d. Retrieved May 31, 2017. ^ a b c Sinclair, Harriet (June 21, 2017). "Trump's 2020 Re-Election Campaign to Kick Off With $35,000-Per-Ticket Dinner At Own Hotel in Washington, D.C." www.newsweek.com. Newsweek. Retrieved June 25, 2017. ^ Ballhaus, Rebecca. "Trump to Hold First 2020 Campaign Fundraiser at Trump Hotel in Washington". www.wsj.com. The Wall Street Journal. Retrieved June 25, 2017. ^ Bykowicz, Julie (June 21, 2017). "Trump to host Trump re-election fundraiser at Trump hotel". www.apnews.com. Associated Press. Retrieved June 25, 2017. ^ a b Drucker, David M. (June 21, 2017). "Trump kicking off 2020 fundraising with high dollar DC fundraiser". www.washingtonexaminer.com. Washington Examiner. Retrieved June 25, 2017. ^ a b Squiteri, Jason (June 28, 2017). "Dem congressman: 'Just plain wrong' for Trump to hold fundraiser at own hotel". www.cnn.com. CNN. Retrieved June 29, 2017. ^ Bykowicz, Julie; Colvin, Jill (June 28, 2017). "Trump rakes in $10 million at first re-election fundraiser". www.abcnews.go.com. ABC News. Associated Press. Retrieved July 3, 2017. ^ Brown, Willie (July 1, 2017). "Trump twisting arms for 2020". www.sfchronicle.com. San Francisco Chronicle. Retrieved July 3, 2017. ^ a b Isenstadt, Alex (June 28, 2017). "Trump rips media, mocks Pelosi at closed-door fundraiser". www.politico.com. Politico. Retrieved July 9, 2017. ^ a b c Bykowicz, Julie; Colvin, Jill (June 29, 2017). "Trump trashes media, cheers wins at $10 million fundraiser". www.apnews.com. Associated Press. Retrieved July 9, 2017. ^ Nuzzi, Olivia (July 9, 2017). "Scenes From the Swamp: (Almost) Inside Trump's $35,000-Per-Plate Reelection Fundraiser". www.nymag.com. New York Magazine. Retrieved July 10, 2017. ^ Liptak, Kevin; Malloy, Allie (June 28, 2017). "White House disinvites press from fundraiser". www.cnn.com. CNN. Retrieved June 29, 2017. ^ "President Trump's politicking raises ethics flags". www.cnbc.com. CNBC. Associated Press. July 28, 2017. Retrieved July 9, 2017. ^ Williams, Janice (June 28, 2017). "Trump 2020 Campaign is Getting Underway at D.C. Hotel, As President Ignores Conflict of Interest Accusations". www.newsweek.com. Newsweek. Retrieved July 10, 2017. ^ The New York Times Editorial Board (June 30, 2017). "Mr. Trump's For-Profit Campaign". www.nytimes.com. The New York Times. Retrieved July 7, 2017. ^ Glueck, Katie (June 7, 2017). "The face of Donald Trump's 2020 campaign". www.mcclatchydc.com. McClatchy. Retrieved June 11, 2017. ^ Figueroa, Laura (June 20, 2017). "Trump's daughter-in-law, Florida guv headline GOP dinner". www.newsday.com. Newsday. Retrieved June 29, 2017. ^ Mark, Michelle (July 1, 2017). "'I'm president and they're not': Trump slams media in speech honoring veterans". www.businessinsider.com. Business Insider. Retrieved July 10, 2017. ^ Kurtz, Judy (July 6, 2017). "Trump winning against Dems in 2020 merchandise sales". www.thehill.com. The Hill. Retrieved July 9, 2017. ^ Sinclair, Harriet (July 9, 2017). "Trump 2020 Merchandise Is Outperforming Democrat Products". www.newsweek.com. Newsweek. Retrieved July 9, 2017. ^ a b c Warren, Michael (August 8, 2017). "White House Watch: Is Mike Pence Running a Shadow Campaign for 2020?". www.weeklystandard.com. The Weekly Standard. Retrieved August 25, 2017. ^ "Image# 201707159066696382 Report of Receipts and Disbursements by an Authorized Committee of a Candidate for the Office of President or Vice President" (PDF). www.fec.gov. Federal Elections Commission. July 15, 2017. Retrieved July 15, 2017. ^ Berman, Mark; Gold, Matea (July 15, 2017). "Trump campaign paid firm of lawyer representing Trump Jr. before emails were made public". www,washingtonpost.com. The Washington Post. Retrieved July 15, 2017. ^ Manchester, Julia (July 15, 2017). "Trump campaign paid Trump Jr.'s lawyer weeks before Russia meeting revelation". www.thehill.com. The Hill. Retrieved July 15, 2017. ^ Sheth, Sonam (July 15, 2017). "Trump campaign paid Trump Jr.'s lawyer $50,000 last month — before revelations that Trump Jr. met with a Russian lawyer". www.businessinsider.com. Business Insider. Reuters. Retrieved July 15, 2017. ^ a b Barabak, Mark K. (August 23, 2017). "Analysis Again breaking ground, Trump takes the permanent campaign to new heights". www.latimes.com. Los Angeles Times. Retrieved September 4, 2017. ^ Alex Pappas (July 25, 2017). "Trump celebrates ObamaCare vote, but avoids criticizing Jeff Sessions at Ohio rally". www.foxnews.com. Fox News. Retrieved July 26, 2017. ^ a b Merica, Dan (July 26, 2017). "Trump makes 'presidential' pitch at Ohio rally". www.cnn.com. CNN. Retrieved August 17, 2017. ^ Huppke, Rex W. (July 27, 2017). "Trump's abnormal behavior knows no boundries". Chicago Tribune. Chicago. ^ Janssen, Kim (July 27, 2017). "Trump's message for Emanuel: 'Get tough'". Chicago Tribune. Chicago. ^ a b Alex Pappas (August 3, 2017). "Trump tells West Virginia rally: 'We didn't win because of Russia. We won because of you'". www.foxnews.com. Fox News. Retrieved August 4, 2017. ^ Martin, Jonathan; Burns, Alexander (August 5, 2017). "Republican Shadow Campaign for 2020 Takes Shape as Trump Doubts Grow". www.nytimes.com. The New York Times. Retrieved August 25, 2017. ^ a b Siciliano, John (August 6, 2017). "Mike Pence blasts 'disgraceful and offensive' report on 'shadow campaign' to unseat Trump in 2020". www.washintonexaminer.com. The Washington Examiner. Retrieved August 25, 2017. ^ Siciliano, John (August 6, 2017). "Kellyanne Conway dismisses claims Trump is a one-term president and faces a Mike Pence threat in 2020". www.washingtonexaminer.com. The Washington Examiner. Retrieved August 25, 2017. ^ Thompson, Isobel (August 7, 2017). "Pence Swears He's Not Running for Trump's Second Term". www.vanityfair.com. Vanity Fair. Retrieved August 25, 2017. ^ "Donald J. Trump for President, Inc. Releases New Campaign Ad". www.donaldjtrump.com. Donald J. Trump for president. August 13, 2017. Retrieved August 15, 2017. ^ Watkins, Eli (August 13, 2017). "Trump re-election campaign releases ad attacking 'enemies'". www.cnn.com. CNN. Retrieved August 13, 2017. ^ a b Estepa, Jessica (August 15, 2017). "Trump campaign accuses CNN of censorship for not airing 'president's enemies' ad". www.usatoday.com. USA Today. Retrieved August 15, 2017. ^ Seipel, Brooke (August 22, 2017). "Trump claims news media turned off cameras at rally as live coverage goes uninterrupted". www.thehill.com. The Hill. Retrieved September 5, 2017. ^ "CNN Censors Campaign Ad…Again". www.donaldjtrump.com. Donald J. Trump for President. August 15, 2017. Retrieved August 15, 2017. ^ Wickman, Forrest (August 15, 2017). "Trump Just Retweeted a Cartoon of the "#TrumpTrain" Running Someone Over. Then He Retweeted a Tweet Calling Him a Fascist". www.slate.com. Slate. Retrieved August 15, 2017. ^ Nakamura, David; Davis, Aaron C. (August 15, 2017). "After Charlottesville, Trump retweets – then deletes – image of train running over CNN reporter". www.washingtonpost.com. The Washington Post. Retrieved August 15, 2017. ^ "Phoenix, AZ". www.donaldjtrump.com. Donald J. Trump for President. n.d. Archived from the original on August 16, 2017. ^ a b c d e f g h Isenstadt, Alex (August 21, 2017). "Trump ramping up for 2020 reelection". www.politico.com. Politico. Retrieved August 21, 2017. ^ Silva, Daniella (August 22, 2017). "Phoenix Mayor Calls on Trump to Apologize at Rally for Charlottesville Comments". www.nbc.com. NBC News. Associated Press. Retrieved August 22, 2016. ^ a b c d e f Bradner, Eric (August 22, 2017). "Donald Trump defends Charlottesville responses, omits reference to 'many sides'". www.cnn.com. CNN. Retrieved August 23, 2017. ^ Phillips, Ariella (August 25, 2017). "Watchdog wants to know if Ben Carson used federal money to travel to Trump rally". www.huffingtonpost.com. Huffington Post. Retrieved August 25, 2017. ^ May, Charlie (August 24, 2017). "Spokesperson denies Ben Carson violated the Hatch Act". www.salon.com. Salon. Retrieved August 25, 2017. ^ Silva, Daniella (August 22, 2017). "Phoenix Mayor Calls on Trump to Apologize at Rally for Charlottesville Comments". www.nbcnews.com. NBC News. Retrieved August 22, 2016. ^ a b c Wagner, Meg; Wills, Amanda (August 22, 2017). "Trump's rally in Phoenix: Live updates". www.cnn.com. CNN. Retrieved August 24, 2017. ^ a b Bykowicz, Julie (August 23, 2017). "Trump talks unity, but detours into angry words for media". www.apnews.com. Associated Press. Retrieved August 23, 2017. ^ a b c d Montanaro, Domenico (August 23, 2017). "5 Truths About Trump Displayed In His Phoenix Rally". www.npr.com. NPR. Retrieved August 22, 2017. ^ Phillips, Amber (August 23, 2017). "Trump blames the media for nearly all of his problems as president". www.washingtonpost.com. The Washington Post. Retrieved August 23, 2017. ^ Steltler, Brian (August 23, 2017). "Here's how reporters are responding to Trump's new amped-up attacks". www.money.cnn.com. CNNMoney. Retrieved August 23, 2017. ^ a b Sally, Persons (August 23, 2017). "James Clapper, former DNI chief, questions Trump's fitness for office". www.washingtontimes.com. The Washington Times. Retrieved August 24, 2017. ^ a b "Trump Threatens A Government Shutdown To Build The Border 'Wall'". www.facebook.com. Newsy. August 23, 2017. Retrieved August 23, 2017. ^ Kasperowicz, Pete (August 22, 2017). "Trump threatens government shutdown over border wall funding". www.washingtonexaminer.com. Washington Examiner. Retrieved August 23, 2017. ^ Bryan, Bob (August 23, 2017). "Trump just 'dramatically raised the specter' of a government shutdown over the wall – and he'd most likely 'get the blame'". www.businessinsider.com. Business Insider. Retrieved August 23, 2017. ^ a b Choi, James (August 23, 2017). "'Downright Scary and Disturbing': James Clapper questions if Trump is 'looking for a way out'". www.businessinsider.com. Business Insider. Retrieved August 24, 2017. ^ a b "The Latest: Trump says US will 'probably' end NAFTA". www.apnews.com. Associated Press. August 23, 2017. Retrieved August 24, 2017. ^ Kiely, Eugene; Robertson, Lori; Jackson, Brooks; Gore, D'Angelo; Schipani, Vanessa (August 23, 2017). "Trump's Phoenix Fiction". www.factcheck.org. FactCheck.org. Retrieved September 5, 2017. ^ Sharockman, Aaron; Valverde, Miriam (August 22, 2017). "Fact-checking President Donald Trump's campaign rally in Phoenix". www.politifact.com. Politifact. Retrieved September 5, 2017. ^ Kurtzleben, Danielle (August 23, 2017). "Fact Check: 10 Statements From Trump's Phoenix Speech". www.npr.com. NPR. Retrieved September 5, 2017. ^ Cillizza, Chris (August 23, 2017). "Donald Trump's 57 most outrageous quotes from his Arizona speech". www.cnn.com. CNN. Retrieved September 5, 2017. ^ Vales, Lienz (August 23, 2017). "James Clapper calls Trump speech 'downright scary and disturbing'". www.cnn.com. CNN Politics. Retrieved August 23, 2017. ^ Diaz, Danniella (August 23, 2017). "Phoenix mayor: Trump continued 'to divide this country' with rally speech". www.cnn.com. CNN. Retrieved August 25, 2017. ^ ""What we have witnessed was a total eclipse of the facts," CNN's Don Lemon says after President Donald J. Trump's campaign rally in Phoenix". www.cnn.com. CNN. August 22, 2017. Retrieved August 23, 2017. ^ Ryan, Josiah (August 23, 2017). "Don Lemon: Trump speech a 'total eclipse of the facts'". www.cnn.com. CNN. Retrieved August 23, 2017. ^ a b c Van Zuylen-Wood, Simon (August 23, 2017). "The Chaos Candidate Returns to His Favorite Tinder Box". www.politico.com. Politico. Retrieved August 23, 2017. ^ a b Cassidy, Kaila; White, Morgan (August 23, 2017). "Phoenix police say they will investigate use of force at Trump rally". azcentral.com. The Arizona Republic. Retrieved August 23, 2017. ^ Sederholm, Jillian (August 24, 2017). "Alec Baldwin's Trump Pops in on 'Weekend Update: Summer Edition' to Clear Some Things Up". www.nbcnews.com. NBC News. Retrieved August 25, 2017. ^ Abramovitch, Seth (September 28, 2016). "'Saturday Night Live' Casts Alec Baldwin as Its New Donald Trump". The Hollywood Reporter. Retrieved August 25, 2017. ^ Caplan, David (August 24, 2017). "Alec Baldwin reprises Trump 'SNL' role, spoofs Phoenix rally". www.abcnews.com. ABC News. Retrieved August 25, 2017. ^ Jacobs, Jennifer; Cirilli, Kevin (August 28, 2017). "Trump Punishes Longtime Aide After Angry Phoenix Speech, Sources Say". www.bloomberg.com. Bloomberg News. Retrieved August 30, 2017. ^ Bradner, Eric; Tatum, Sophie; Liptak, Kevin (August 24, 2017). "After angry rally, Trump calls for healing in Nevada". www.apnews.com. Associated Press. Retrieved August 24, 2017. ^ Tracy, Abigal (August 21, 2017). "Trump Confronts His 2020 Paradox". www.vanityfair.com. Vanity Fair. Retrieved September 4, 2017. ^ Tracy, Abigal (April 5, 2017). "The G.O.P. Race to Primary Trump Has Already Begun". www.vanityfair.com. Vanity Fair. Retrieved September 4, 2017. ^ Willis, Oliver (August 21, 2017). "Trump panics as Pence prepares to take him on in election more than 1,100 days away". www.shareblue.com. Shareblue. Retrieved September 4, 2017. ^ de Haldevang, Max (August 29, 2017). ""What a crowd, what a turnout!" Trump visited Texas and forgot to mention Hurricane Harvey's victims". www.qz.com. Quartz. Retrieved August 30, 2017. ^ Phillip, Abby (August 31, 2017). "How Trump's Texas disaster relief visit turned into an impromptu rally". www.washingtonpost.com. The Washington Post. Retrieved August 31, 2017. ^ Thrush, Glenn (August 29, 2017). "'What a crowd, what a turnout,' Trump tells cheering crowd in Texas". www.bostonglobe.com. Boston Globe. Retrieved August 29, 2017. ^ Langille, Sean (August 16, 2017). "Pro-Trump 'Mother of All Rallies' scheduled for September". The Washington Examiner. Clarity Media Group. Retrieved September 16, 2017. ^ ""Mother of all Rallies" President Trump supporters gather in rally". Odessa, Texas: KOSA-TV. Retrieved September 17, 2017. ^ a b c Blumenthal, Paul; Marans, Daniel. "Juggalos Draw Bigger Crowd On The National Mall Than Pro-Trump Rally". HuffPost. Retrieved September 17, 2017. ^ a b Shugerman, Emily (September 16, 2017). "Trump supporters organised a rally for 1 million people. Only 1,000 turned up". The Independent. London: Independent Print Limited. ISSN 0951-9467. OCLC 185201487. Retrieved September 17, 2017. ^ "Pro-Trump 'Mother of All Rallies' eclipsed by Juggalo event in Washington DC (Video)". RT. Retrieved September 17, 2017. ^ a b Hughes, Gray; Ferrar, Doug (August 31, 2017). "Rally to support President Trump planned for Sept. 9 in Georgetown". www.delmarvanow.com. The Daily Times DelmarvaNow (Gannett Company). Retrieved August 31, 2017. ^ Duvernay, Adam (September 9, 2017). "President Donald Trump supporters rally in Georgetown". www.delawareonline.com. Delaware Online (The News Journal). Retrieved September 10, 2017. ^ Coles, Caroline (September 9, 2017). "Sussex County Republican Committee Sponsors Trump Rally". www.wboc.com. WBOC-TV. Retrieved September 10, 2017. ^ a b c d Riotta, Chris (October 25, 2017). "Trump Flies to Texas For His Re-Election Fundraiser and Writes It Off As Taxpayer Expense". www.newsweek.com. Newsweek. Retrieved October 27, 2017. ^ a b "Donald Trump to visit Dallas for fundraiser". www.dallasnews.com. Dallas Morning News. Associated Press. October 9, 2017. Retrieved October 9, 2017. ^ Hayes, Christal (October 16, 2017). "Trump Wants to Run in 2020 Election Against the Woman He Already Beat: Hillary Clinton". www.newsweek.com. Newsweek. Retrieved October 18, 2017. ^ Johnson, Jenna (October 25, 2017). "Trump in Texas: 'I'm the builder president. Remember that.'". www.washingtonpost.com. The Washington Post. Retrieved October 27, 2017. ^ @markknoller (October 25, 2017). "By my count, this will be Pres Trump's 10th political fundraiser since taking office. 9 of 10 were closed to press coverage including today" (Tweet) – via Twitter. ^ a b c Riotta, Chris (November 3, 2017). "Lara Trump Taking on White House Duties in Troubling and Unprecedented Move, Officials Say". www.newsweek.com. Newsweek. Retrieved November 20, 2017. ^ Schwarz, Sam (December 20, 2017). "SUPPORT FOR DONALD TRUMP'S IMPEACHMENT IS HIGHER THAN HIS RE-ELECTION CHANCES". www.newsweek.com. Newsweek. Retrieved February 16, 2018. ^ Cole, Devan (February 25, 2018). "Trump campaign emails photo of Parkland survivor, asks for donations". CNN. Retrieved February 26, 2018. ^ Isenstadt, Alex; Samuelsohn, Darren (February 27, 2018). "Trump picks loyalist Parscale to run 2020 campaign". Politico. Retrieved February 28, 2018. ^ Jones, Rhett (February 27, 2018). "Trump's New Campaign Manager Is Already Facebook's Worst Nightmare". Gizmodo. Retrieved February 28, 2018. ^ Stewart, Martina (March 10, 2018). "Trump In Pennsylvania: I Need Rick Saccone To Help 'Keep America Great!'". NPR. Retrieved March 11, 2018. ^ Breech, John (March 15, 2018). "Buccaneers owner hosts Donald Trump at home fundraiser just months after NFL spat". ^ Levin, Bess (March 14, 2018). "TRUMP 2020 CAMPAIGN NOW ACCEPTING ALL WHITE HOUSE REJECTS". www.vanityfair.com. Vanity Fair. Retrieved March 15, 2018. ^ Manchester, Julia (March 13, 2018). "Trump campaign hires Katrina Pierson". www.thehill.com. The Hill. Retrieved March 15, 2018. ^ Gray, Kathleen; Siacon, Aleanna; Egan, Paul (April 26, 2018). "Trump skips press dinner for rally: 'I'd rather be in Washington, Mich., than Washington, D.C.'". www.usatoday.com. USA Today (Detroit Free Press). Retrieved May 14, 2018. ^ McGraw, Meredith (May 14, 2018). "Trump stumps for Republicans and debuts new campaign slogan in Indiana". www.abc.go.com. ABC News. Retrieved May 14, 2018. ^ a b Murphy, Mike, "At Minnesota rally, Trump brags he's more elite than ‘the elite’", MarketWatch, June 21, 2018. June 23, 2018. ^ a b Sorkin, Amy Davidson, "Never Mind the Children. In Duluth, Trump Celebrates Himself", The New Yorker, June 21, 2018. June 23, 2018. ^ Salama, Vivian, "Trump Tests His Appeal in Nevada, a State Clinton Won" (subscription required), Wall Street Journal, June 23, 2018. Retrieved June 24, 2018. ^ Rogers, Katie, "Trump, at rally, vows to Carry On Anthony Kennedy's Legacy With Court Pick", The New York Times, June 27, 2018. Retrieved July 1, 2018. ^ "Donald Trump used a word he's 'not supposed to.' Here's why". ^ "'I am a nationalist': Trump's embrace of controversial label sparks uproar". 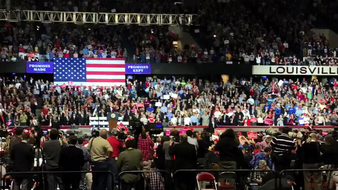 ^ "Is Trump Transforming Midterms With Arena-Size Rallies? - RealClearPolitics". www.realclearpolitics.com. Retrieved February 5, 2019. ^ "Senate Election Results 2018: Live Midterm Map by State & Analysis". www.politico.com. Retrieved February 5, 2019. ^ CNN, Dan Merica. "Trump gears up for 2020 re-election by tightening grip on party". CNN. Retrieved February 4, 2019. ^ Isenstadt, Alex (January 7, 2019). "Trump campaign moves to stave off mayhem at 2020 convention". Politico. Retrieved February 2, 2019. ^ a b "Republican Party to Express 'Undivided Support' for Trump". VOA. Retrieved February 4, 2019. ^ a b Miller, Zeke; Peoples, Steve (February 4, 2019). "Trump campaign takes steps to prevent a challenge within GOP". AP NEWS. Retrieved February 4, 2019. ^ Miller, Zeek. "Trump campaign takes steps to prevent a challenge within GOP". ABC News. Retrieved February 21, 2019. ^ "Trump Supporter Violently Shoves BBC Cameraman At Rally In El Paso, Texas". NPR.org. ^ Lybrand, Holmes. "Fact-checking Trump (and others) at CPAC". CNN. ^ Sheth, Sonam. "Mueller found that there was no Trump-Russia conspiracy but did not 'exonerate' the president on obstruction". Business Insider. ^ Higgins, Tucker (March 25, 2019). "Trump 2020 campaign will blast Democrats over Mueller until election". www.cnbc.com. ^ Re, Gregg (March 28, 2019). "Trump, in fiery first rally since Mueller vindication, calls on Dems to stop 'ridiculous bullsh--'". Fox News. ^ Orr, Gabby. "Trump tests post-Mueller vengeance campaign". POLITICO. ^ "Trump visits US-Mexico border: Live updates". www.cnn.com. April 5, 2019. ^ Nicholas, Peter (April 3, 2019). "Donald Trump's Never-Ending Campaign Keeps Getting Angrier". The Atlantic. ^ Morrissey, Ruben Vives, Alejandra Reyes-Velarde, Kate. "Live: Trump departs LAX for Las Vegas". latimes.com. ^ Bykowicz, Julie; Colvin, Jill (June 29, 2017). "Trump trashes media, cheers wins at $10 million fundraiser". The Washington Post. Retrieved July 8, 2017. ^ Donald J. Trump for President, Inc. (July 20, 2017). "Filing FEC-1174081". Federal Election Commission. Retrieved October 18, 2017. ^ Donald J. Trump for President, Inc. (September 15, 2017). "FEC Form 3P – Report of receipts and disbursements – Filing FEC-1182043". Federal Election Commission. Retrieved October 18, 2017. ^ Donald J. Trump for President, Inc. (October 15, 2017). "FEC Form 3P – Report of receipts and disbursements – Filing FEC-1186850". Federal Election Commission. Retrieved October 18, 2017. ^ Donald J. Trump for President, Inc. (February 7, 2018). "FEC Form 3P – Report of receipts and disbursements – Filing FEC-1207393". Federal Election Commission. Retrieved February 7, 2018. ^ Donald J. Trump for President, Inc. (April 15, 2018). "FEC Form 3P – Report of receipts and disbursements – Filing FEC-1222729". Federal Election Commission. Retrieved May 14, 2018. ^ Donald J. Trump for President, Inc. (July 15, 2018). "FEC Form 3P – Report of receipts and disbursements – Filing FEC-1248228". Federal Election Commission. Retrieved August 15, 2018. ^ Donald J. Trump for President, Inc. (October 15, 2018). "FEC Form 3P – Report of receipts and disbursements – Filing FEC-1272561". Federal Election Commission. Retrieved October 17, 2018. ^ Donald J. Trump for President, Inc. (January 31, 2019). "FEC Form 3P – Report of receipts and disbursements – Filing FEC-1312481". Federal Election Commission. Retrieved February 5, 2019. ^ "Donald J. Trump for President, Inc. / Presidential – Principal campaign committee / Financial summary – Two-year period 2017–2018". www.fec.gov. Federal Election Commission. December 31, 2018. Retrieved February 5, 2019. ^ Donald J. Trump for President, Inc. (April 15, 2019). "FEC Form 3P – Report of receipts and disbursements – Filing FEC-1326131". Federal Election Commission. Retrieved April 19, 2019. ^ Cadei, Emily (May 18, 2017). "Trump 2020 Campaign Claims a Fundraising Record Amid Russia Probes". www.newsweek.com. Newsweek. Retrieved May 18, 2017. ^ Bedard, Paul (May 18, 2017). "Trump 2020 raises record $314,000 in just one day". www.washingtonexaminer.com. The Washington Examiner. Retrieved May 18, 2017. ^ "Trump's re-election campaign raised more than $30 million in first-quarter of 2019". Reuters. April 14, 2019. Retrieved April 15, 2019. ^ Ballhaus, Rebecca (April 17, 2017). "Donald Trump's Companies Benefit From Campaign Funds". Wall Street Journal. New York City. Retrieved April 18, 2017. ^ Ashley, Balcerzak; Levinthal, Dave (October 15, 2017). "Donald Trump campaign ramps up 2020 re-election fundraising". www.publicintegrity.org. The Center for Public Integrity. Retrieved October 18, 2017. ^ a b Jeremy, Diamond (October 17, 2017). "Donating to Trump? Campaign is spending $1 of every $10 on legal fees". www.cnn.com. CNN. Retrieved October 18, 2017. ^ Fischer, Sara (March 19, 2019). "Another Trump Facebook election - Axios". Axios. Retrieved March 19, 2019. ^ a b c Hillyard, Vaughn (May 18, 2017). "Pence Creates PAC Ahead of 2018, 2020 Elections". www.nbcnews.com. NBC News. Retrieved May 18, 2017. ^ a b "Filing FEC-1162693". docquery.fec.gov. Federal Election Commission. May 17, 2017. Retrieved May 18, 2017. ^ "Page by Page Report Display (Page 290 of 1081)". www.fec.gov. Federal Elections Commission. May 15, 2017. Retrieved May 28, 2017. ^ "Page by Page Report Display (Page 575 of 1081)". www.fec.gov. Federal Elections Commission. May 15, 2017. Retrieved May 28, 2017. ^ "Page by Page Report Display (Page 921 of 4397)". www.fec.org. Federal Elections Commission. May 17, 2017. Retrieved May 28, 2017. ^ "How Facebook ads helped elect Trump". Retrieved October 9, 2017. ^ Bykowicz, Julie (May 18, 2017). "Trump advisers start 'America First Policies' nonprofit". www.usnews.com. U.S. News & World Report. Associated Press. Retrieved May 18, 2017. ^ a b c d Sexton, Adam (September 3, 2017). "Former Trump campaign staffers to launch new organization in NH". www.wmur.com. WMUR-TV. Retrieved August 3, 2017. Wikimedia Commons has media related to Donald Trump presidential campaign, 2020. This page was last edited on 23 April 2019, at 15:15 (UTC).